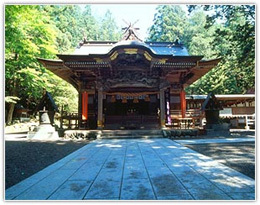 The deities enshrined at the shrine are recognized as kami to protect people from fire and other disasters. Over a million worshippers visit from all over the Kanto area each year. Prayers are given daily for the safety of one&apos;s family, prosperity in business, avoidance of fire and robbery, traffic safety, good fortune with money, and so on. It is important to follow this manner, but it is more important to have a sincere attitude.